In 1974, a Super-Consolidation took place at DC Comics, as the publisher combined a number of cancelled titles featuring Superman’s supporting cast (being LOIS LANE, JIMMY OLSEN and SUPERGIRL) into a new series called THE SUPERMAN FAMILY. The following year, Tarzan and Batman each got their own FAMILY titles (along with the awkwardly titled SUPER-TEAM FAMILY, implying that the Challengers of the Unknown did some breeding with the Teen Titans or something). 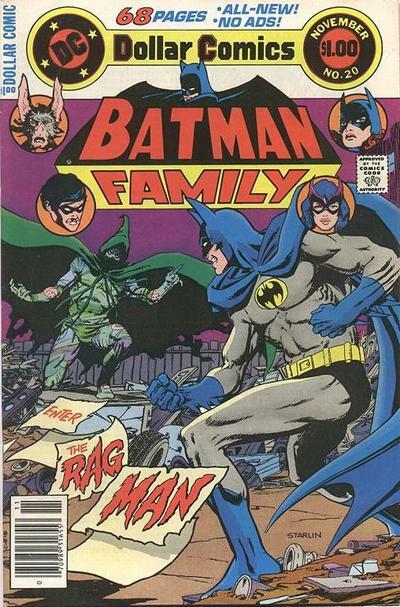 BATMAN FAMILY contained a mix of new stories and reprints starring Batgirl, Robin (often teaming up), Alfred, Commissioner Gordon, Man-Bat, Batwoman and more of the Dark Knight’s supporting cast. In fact, Batman’s roster of friends and foes is widely regarded as the richest in comics (with Spider-Man being his only arguable competition). Sadly, most of the stories in BATMAN FAMILY were kinda forgettable, as they were often done by some longtime DC workhorses who, shall we say, had a tendency to phone it in (the oft-vilified Vince Colletta’s inks graced these pages often). 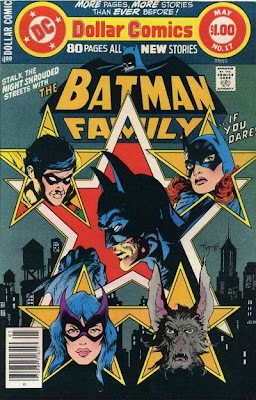 I used to own BATMAN FAMILY #11 (June 1977), but don’t remember it. Still, this cover (by Jim Aparo) is a hoot. I love the idea of superheroes fashioning formal wear in the style of their costumes, and it must have been a nice change of pace for Robin to wear long pants! Robin and Batgirl had some romance over the years, but you know what can happen when all a couple has in common is their work. 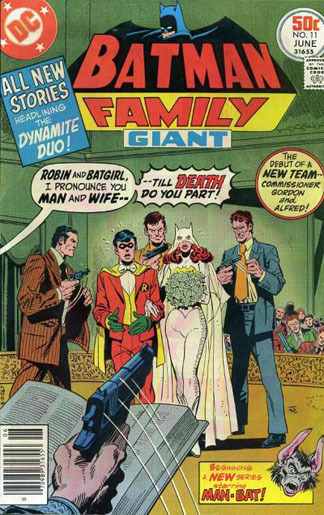 With #17, the comic book became one of DC’s 80-page Dollar Comics and the head of the family was added to the roster. Suddenly BATMAN FAMILY was worth picking up. 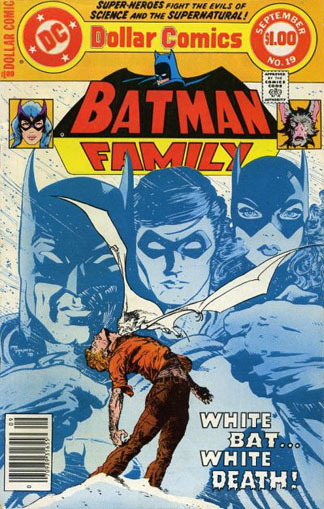 #19 (Sept. 1978), a comic I DO still own, features “The Tomb of the White Bat” by Batman’s best Bronze scripter, Denny O’Neil, with the terrific (and rare) art team of Michael Golden and Craig Russell. The cover by Mike Kaluta is even better (and really makes me wish he would've drawn the character more). When BATMAN FAMILY was cancelled with #20 (featuring a great Jim Starlin cover with Batman meeting Ragman, another character due for a BB treatment), the “Family” theme was temporarily transferred to DETECTIVE COMICS, which became a giant sized book from #481-495. In years since, the various versions of Robin and Batgirl as well as Huntress and Catwoman have gotten their own comics, both ongoing and limited series. In fact, of all the Batman Family, I think only Alfred never got his own book. Poor Alfred. Everyone takes the butler for granted. NEXT WEEK: The final Bat-Bronze-Beauty: THE JOKER gets his due! Please scan a page where Vinnie the Great "phoned it in" and publish it in your blog and if its crappy inking I will buy you a new car. Mr. McFan, I don't need to post any crappy Colletta work here, as you've posted more than enough examples on your own site... what, are you RELATED to him or something? A whole website defending Vince Colletta? Seriously? Oh, well, as I'm fond of pointing out, all opinions on art are subjective, and nobody's right and nobody's wrong. Pops, I didn't think that you could actually come up with an example of Vin's work that wasn't, at least, professionally done-even for a new car. If you find one, you know where to find me. You are correct about art being subjective but you miss the mark when you write that "nobody's wrong". As you have demonstrated by failing to step up to the plate-you are wrong. As for my web site, it's not there to defend anyone, merely to point out what an incredible number of doofuses there are who pass themselves off as "experts". Unlike most blogs, you will find a number of creators on mine who have graciously provided commentary and insight into, not only Colletta but the comic book industry as a whole. Dan, my point was, I don't need to post any examples of how crappy Colletta's work is because YOUR site is FULL OF THEM... (besides, why would I clutter up my site with artwork and a post that's in essence merely an argument with one person?). And I heartily disagree with your assertion that an opinion on art can be "wrong." Reaction to art is, regardless of the amount of empirical knowledge possessed, an emotional response and you can't tell someone that they aren't feeling what they're feeling. I think that Vince Colletta was an awful artist, and have since I was a little kid (even then I hated when he inked Curt Swan instead of Murphy Anderson or Bob Oksner or even Tex Blaisdell) and always will. I admire your tenacity (but still wonder where it comes from), but think you're on a fool's errand trying to pick fights with people who disagree with you.